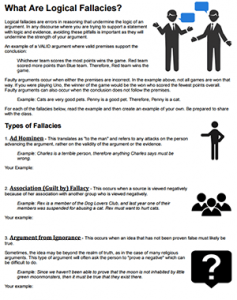 This activity can be a good introduction to logic and how fallacies can undermine claims in an argument. This can be included in introductory lessons on the scientific method and instruction on how to formulate and support conclusions with data. I’ve also found this to be useful before lessons on evolution where we discuss myths regarding evolution and how many of those ideas are not based on sound science or logic. In advanced classes of all subjects, students will examine data and ideas that may result in disagreements. If students have a good foundation in logic and basics of argumentation, discussions will likely be more productive. In this activity, students read about logical fallacies, examples include guilt by association, straw man, red herring, false dichotomy, and ad hominen arguments. After reading a description and an examples, students formulate their own examples. This is best done in pairs or small groups so that students can discuss their ideas.